From the studio that brought you MIRACLES FROM HEAVEN & CLOUDY WITH A CHANCE OF MEATBALLS comes the timeless tale about faith, friendship, and the importance of believing in yourself. AFFIRM Films and Sony Pictures Animation’s THE STAR arrives for the first time on Blu-ray + DVD + Digital February 20 from Sony Pictures Home Entertainment. The heartwarming animated comedy follows a small but brave donkey named Bo (voiced by Steven Yeun, “The Walking Dead”), who yearns for a life beyond his daily grind at the village mill. One day he finds the courage to break free and finally goes on the adventure of his dreams. On his journey, he teams up with Ruth (voiced by Aidy Bryant, “Saturday Night Live”), a lovable sheep who has lost her flock and Dave (voiced by Keegan-Michael Key, Friends From College), a dove with lofty aspirations, along with three wisecracking camels voiced by Tracy Morgan (“30 Rock”), Tyler Perry and Oprah Winfrey. Bo and his new friends follow the star and become accidental heroes in the greatest story ever told. This is the heartwarming film of the Nativity story told from animals' perspective. with some some fun artistic twists. Even though it is fictional storytelling, it stays quite true to the biblical narrative of Jesus' birth. 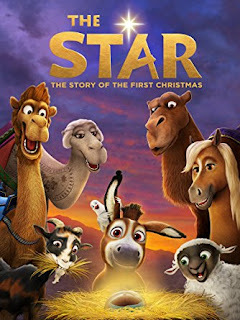 THE STAR follows Bo the donkey who left his former owner to find adventure. He meets a young, pregnant Mary and her husband, Joseph and the take in Bo and help him to heal from his injuries. He teams up with his wisecracking friend who is a dove and a sheep who's lost her flock to make sure Mary and Joseph stay safe from King Herrod's henchman as they make their journey to Bethlehem for the census. We watched this as an entire family, our kids are 10 and 12 and loved this film. It is an instant Christmas classic for us and we will watch it each year. The soundtrack to this film is amazing it features classic Christian songs sung by some of our favorite artists like Mariah Carey, Pentatonix, Fifth Harmony and more. Pick up this movie now for a great family movie night!